Spaghetti acciugata is simply spaghetti with a sauce of anchovies, garlic, capers, and olive oil. 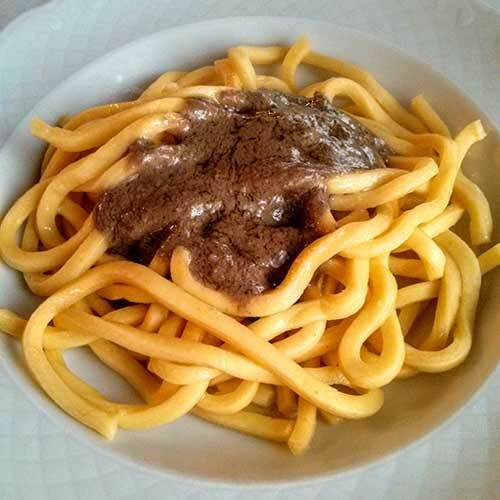 Here it is shown over spaghetti alla chitarra, an egg pasta that’s formed by pushing a sheet of pasta through wires arranged like the strings of a guitar, as is popular in the Abruzzo region. The result is a strand that is square in cross-section. Italians use anchovies for flavoring dishes quite a bit, but it’s usually as a background taste. This recipe brings the lowly anchovy forward to be the star of the dish.